Students in Carnegie Mellon University’s Dietrich College of Humanities and Social Sciences’ global studies capstone seminar spent the semester developing independent projects that draw from their coursework, internships and study abroad experiences. Interested in different ethnic and religious communities and aware of generalizations made about Muslim-American women, Asenjo aimed to find out how Muslim-American women define their experiences. In his research, Asenjo conducted case studies on eight Muslim-American women, selected based on visibility, public sphere, politics, age and residency in the United States, and found that Muslim-American women face a specific reality in the broader context of Global Islam. In his qualitative analysis, Asenjo recognized three common themes among the women: pride, empathy and modesty. Started by Tarana Burke in 2006, the #MeToo movement went viral in 2017 as a way for people to describe their experiences with sexual assault and harassment. Using literature and news sources, Huddleston, examined the #MeToo movement and its initiative to shift the way people talk about sexual violence and its survivors. Huddleston found that the #MeToo movement focused on language as a tool to hold perpetrators accountable for sexual violence and revealed and criticized a culture that allowed perpetrators to feel empowered in their actions. Diving into popular online forums like Reddit, Liu set out to make conversation with young people whose political beliefs identify with the alt-right, a primarily online political movement whose members reject mainstream conservative politics and espouse beliefs and policies typically centered on ideas of white nationalism. Through her case study, Liu found that irony and satire were commonly used as a form of deflection, as a way to protest a society they feel has marginalized them and as an expression of nihilism. More than 100,000 residents of Flint, Michigan, have been potentially exposed to high levels of lead in drinking water as a result of a change in drinking water source. Li examined the tendencies and vulnerabilities of infrastructures, and because infrastructures can’t operate without social organization and the people behind it, Li looked at the roles and responsibilities of the people who were behind making infrastructure decisions. In terms of accountability, after reading through emails, statements and news articles, Li found many of the agencies involved deflected responsibility, and instead efforts were made to maintain status quo. A primary major in computer science, Nanavati conducted a case study to examine the inequalities in K-12 education and how they affect the likelihood of minorities to gain skills related to computer science. Through his case study and volunteering at middle and high schools in Pittsburgh, Nanavati found that students internalize stereotypes that only white or Asian individuals can have careers in computer science, so supporting under-resourced schools to implement classes or after school programs that teach computer science and skills such as computational thinking can inspire students to pursue careers in STEM. Moved by her work with CMU’s FORGE, Navarro-Gutierrez aimed to create a resource for tutors who are helping young refugee students. Navarro-Gutierrez says many of these students are first generation, learning English as a second language and are low-income, which means, historically, they’re at a higher risk of dropping out of school. Navarro-Gutierrez’s resources guide students into college with the hope of teaching them how they can persist in higher education. After working on the Arizona-Mexico border in an immigration detention center, Wolf-Sorokin was inspired to look into the asylum and refugee statuses of Honduran women. Wolf-Sorokin identified cases she that were representative of bigger issues and contextualized them with ethnographic research, statistics, data, newspapers and looking at the penal code in Honduras, finding numerous inequalities. Wolf-Sorokin proposed changes that could be made to shrink limitations against Honduran women, including making court decisions more widely available so people can see how different immigration cases are being interpreted. During a trip to Spain, Gomez, who has Type 1 diabetes, noticed she had to do a lot of adapting to plan her meals and insulin dosages. Because of the emphasis on eating and drinking in social settings, Gomez looked into the social implications of Spaniards with Type 1 diabetes. Gomez discovered that while Spain very well meets most medical needs, there’s a gap in public accommodations to ease social anxiety and increase inclusion for Type 1 diabetics. In addition, Gomez argued there needs to be a change in Spain’s outdated rhetoric, which states those with Type 1 diabetes can’t be hired as police officers, firefighters, civil guards, prison guards or in the military. Interested in health and well-being, Stewart researched the history and benefits of Dalcroze Eurhythmics, a process for awakening, developing and refining innate musicality through rhythmic movement, ear-training and improvisation. Stewart found that Dalcroze Eurhythmics can be used in ways beyond teaching music. In her research, Stewart discovered examples of the process being used to bolster self expression, health and well-being, social integration, improved cognitive function and relaxation. There are also cases of Dalcroze Eurhythmics being used for the benefit of people with Alzheimer’s disease, attention deficit hyperactivity disorder and Down syndrome. 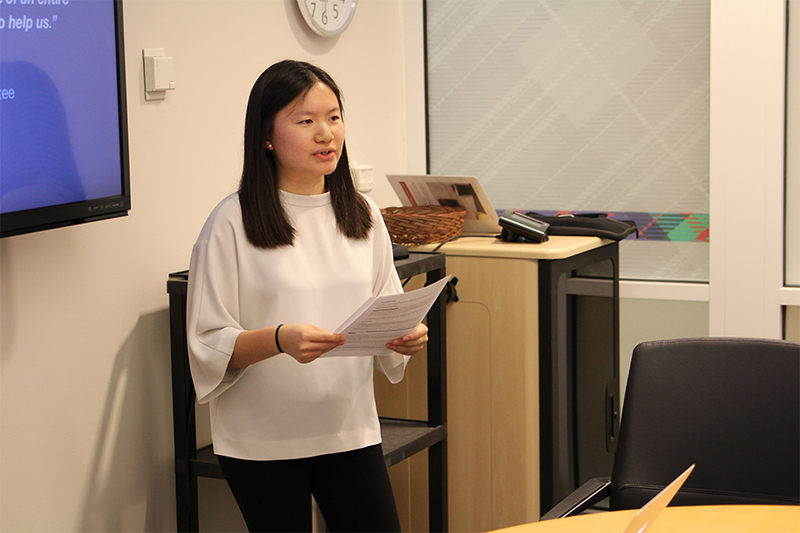 Pictured above: Kelly Li presents on the Fint water crisis.